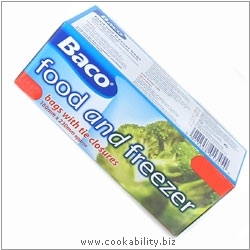 From the makers of Bacofoil. High quality polythene freezer bags. Preserve flavour, retain vitamins, avoid smells. Place food to be frozen in bag and press out as mich air as possible. Use the ties supplied to seal the bag. Approx pack sizes shown.